Nowadays, optimizing your own warehouse is an important part of commercial and accordingly, also successful entrepreneurial dealings, as it is about two crucial and expensive factors, namely time and space. Storage locations are still expensive goods today. Warehouses that are not properly organized will quickly run out of space and order. In turn, lack of order and long walking routes will drastically increase the need for time for usual storage activities like, for example, order picking and ordering and thus, they will lead to unnecessary expenses. However, merely good organization is not enough anymore today in order to optimize one’s warehouse in a fast and cost-effective manner – modern auxiliary means can achieve much more here and they can support you purposefully. Order picking, meaning the arrangement of partial quantities out of the entire scope of the warehouse in the context of, for example, orders or internal material requirements, is part of key warehouse activities. As these tasks are usually not carried out in a fully automated manner yet, they will generate staff costs and because of their time-sensitive nature, they will also often be prone to errors, mistakes and quality defects. That’s why technical support for order pickers is nowadays vital when it comes down to how and to what extent order picking processes and thus, warehouses can actually be optimized. Aside from the classical order picking methods, namely Pick-by-Paper, Pick-by-Scan, Pick-by-Voice and Pick-by-Light, especially Pick-by-Vision is considered a future-oriented new hope as it combines the advantages of some of the other methods and avoids some of their disadvantages at the same time. Pick-by-Vision supports order picking processes with the aid of data glasses. Depending on their respective application purposes, such data glasses as are also known from home environments get equipped with suitable sensors, like, e.g., barcode scanners, voice recognition devices, etc., and connected to existing systems through individualized software. Thus, order pickers receive extensive information on their work, such as on built-in route plans, automated removals from stock and re-orders or they will be helped through automated documentation functions. Almost all parts of order picking processes can be optimized with the aid of data glasses and suitable software. Aside from visibly enhanced efficiency (picking speed), improved quality management (less picking errors and consequently, enhanced customer satisfaction) also needs to be emphasized especially here. 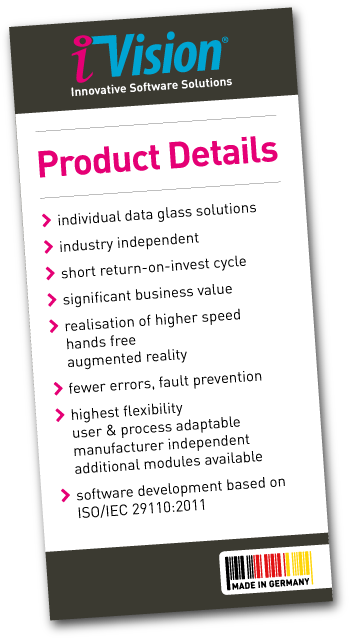 Our iVision® software is a flexible solution, which is independent of manufacturers, that serves to connect data glasses and smart glasses to existing processes and IT systems, particularly for purposes of optimizing order picking processes in your warehouse. We can bring about significant optimizations in your warehouse as well when it comes down to efficiency but also to quality with the aid of customized solutions. The flexibility of the iVision® solution, which can be integrated with ease and excellent results into already existing processes and software landscapes, needs to be emphasized here. So, larger interferences with established processes and systems can be avoided to the largest possible extent. Don’t hesitate to get in touch with us. We are happy to explain you in a detailed and non-binding manner how iVision® can also optimize your warehouse. Are you also looking for a modern and efficient software to optimize your warehouse?